If you're looking for DSLR image quality in a point-and-shoot-style camera, then the Canon EOS M100 makes a lot of sense. However, for us, it's a bit of a hit-and-miss camera. Canon's entry-level mirrorless camera, the EOS M100, is the smallest and simplest in the company's range yet, with stripped-back design and flip-up LCD touchscreen. It's designed to appeal to beginners seeking a point-and-shoot experience without compromising on quality. The design is fairly similar to the Fujifilm X-A10 or Panasonic Lumix GX800. While the EOS M100 may feel like a compact camera, it packs much the technology you'd expect from a DSLR, such as the large-scale 24.2-megapixel sensor at its heart, featuring Dual Pixel AF for speedy autofocus. The lenses can be removed and swapped for others in Canon's M-mount line-up, plus there's the option of paring the camera with larger EF-mount lenses (the ones for its DSLR range) via an adapter. It's a slightly odd prospect, using pro-level glass with a point-and-shoot-style camera. So does Canon strike the perfect balance between an easy-to-use point-and-shoot camera with pro aspirations when it comes to image quality? Is the M100 truly for beginners? The EOS 100 is one small and simple camera, with smooth plastic exterior. Without a lens attached it's like holding one of the Canon Powershot S range of compact cameras. Attach a lens and all is changed. Any lens sticks out, of course, so you won't fit the combination in a trouser pocket. That said, for camera with a sensor as large as this - what's known as APS-C, which is the same size as you'll find in a DSLR camera - the EOS M lenses are all impressively compact in size, comparable to Olympus'/Panasonic's Micro Four Thirds lenses. Most people buying the M100 will get the 15-45mm kit lens and, we suspect, not bother with purchasing any more lenses. Maybe one more at most; but at this entry-level of the interchangeable lens camera market most users stick with what's in the box. For better image sharpness and smaller build, we would totally recommend the EF-M 22mm pancake lens. It's the shortest lens in the range and when mounted to the EOS M100 the combination really is tiny. Although that means no zoom, if that's an issue for you. In day-to-day use, navigating the M100 is pretty much all achieved via the LCD touchscreen. There are only a few buttons, which will be easy to navigate, but aren't essential as most button controls can be bypassed in favour of the touchscreen. Yet for all its intention, the EOS M100 is not as beginner-friendly as we would expect. There's no Guided User Interface (GUI) for those wanting to learn about photography - which features on the Canon EOS 200D DSLR, which is almost like an in-house competitor. Of all EOS cameras, we're surprised the EOS M100 lacks on-screen in-camera tutorials. Sure, you have the option to whack the camera in Scene Intelligent Auto mode and let it get on with its thing, but we suspect most users will do this and not learn a jot about photography. However, there is the Record Mode where PASM exposure control is available - that's Programme auto, Aperture priority, Shutter priority, and Manual - alongside picture effects, including Creative Assist. It feels like the camera is setup to hide manual exposure controls and when found, there is little explanation as to what they are and how to use them. Creative Assist mode is the closest we get to in-camera tuition. Its dumbed-down language communicates manual exposure controls in plain English. Want to change aperture? Then it's the "background" slider with Blurry and Sharp illustrated at either end. Thus, for us, the M100 is a camera that feels, well, a little confused. One way to think about the M100 is as a second, smaller camera to complement an existing DSLR. The main menu of the M100 has the same look and so do the images, so no compromises there. Thing is, the M100 uses M-mount lenses, which are a different fitting to EF-mount lenses (as used by Canon DSLR cameras). So, if you already have a bunch of EF lenses then, well, you're going to have to buy the Canon EF-to-EOS-M adaptor. It definitely makes sense for Canon DSLR users with EF lenses to factor in the cost of the adaptor when considering an EOS M camera. For the best part, the adaptor works seamlessly, with full electronic communication between lens/ and camera maintained, plus what appears to be uncompromised autofocus speed. We tested with two of Canon's most popular lenses - the EF 50mm f/1.8 and EF 24-105mm f/4, the latter dwarfing the tiny body of the M100. Despite the size mis-match, it's the M100's handling that's more of an issue. DSLR users will generally have some grasp of how to operate their camera and will find the limits of the EOS M100 take some getting used to. As a result, we think the similar EOS 200D ticks a lot more boxes. Sure, its DSLR nature means it's bigger, but in reality it's not that much larger. Another continued downside to mirrorless cameras is their inferior battery life. The EOS M100 is not so bad against its rivals, but cannot compete against Canon DSLRs such as the 200D - which has at the least twice the staying power. Expect sub-300 shots per charge from the M100 as a result. In its favour, the inconspicuous look of the EOS M100 can be an advantage in many contexts. Having a point-and-shoot-style camera that can provide the same image quality that you know from your DSLR without anyone blinking an eye that you're carrying a compact-like camera? Well, now there's a thought. The M100's flip-up LCD touchscreen offers comprehensive camera control and navigation. You can use touch shutter, touch AF, navigate menus, plus scroll and pinch-to-zoom in image playback. Nothing is lacking. Plus, as an aside, there's no option for a viewfinder here, so all images are composed using the screen anyway. The screen can tilt between a full range of angles, from flat against the camera to 180-degrees around to face forward. This means you can tilt the display up at 90-degrees for on-the-ground and waist-level shooting, but it won't tilt the opposite way for above-the-head shots. The display itself has a bright 1.04-million-dot resolution. We did not have to clean the screen too often despite all the touch use, thanks to a decent coating. However, in bright daylight it can be worth manually dialling up the brightness of the screen to its maximum setting for a clearer view. As the M100 is a mirrorless camera, it relies on its sensor-based autofocus. Which, here, is the excellent Dual Pixel AF system, complete with on-sensor phase-detection pixels for the utmost speed - it's far quicker than an equivalent Nikon, with only Panasonic's cameras, in our book, being ahead of the curve. Even in low contrast light, the M100's autofocus is impressively quick, especially when using wider aperture lenses. It's not as quick as the dedicated phase-detection autofocus as found in Canon's through-the-viewfinder DSLR cameras, but it's still decent. All in all, autofocus is snappy but not class-leading. This isn't really a camera to take to the races - despite burst shooting at 6.1fps (for up to 89 JPEG images) - but it will cater for a family weekend break. There were also a few occasions for us when single point Touch AF produced back-focused results, without the subject being sharp. However, with Face Detection in play, those eyes are usually nice and sharp in portraits. It's 2017, so connectivity is an increasingly standard part of cameras' feature sets. One of Canon's real strengths in the M100 is the seamless wireless connectivity: once an initial pairing has been made between camera and smart device, it takes only a push of the wireless button on the rear of the M100 to establish a Bluetooth connection for sharing images. Canon continues to launch cameras without 4K video recording, which could be deemed overkill for a camera such as the M100 anyway. The camera's Movie Auto Exposure will capture Full HD videos without any manual control over exposure. When the camera gets it right, you'll get some lovely looking videos with the option of slowing those 60fps videos down for smooth slow-mo. For moving images Canon's Dual Pixel AF performs very well indeed, capturing videos with accurate and sharp focus. That, Canon says, is its priority instead of offering higher resolution. It's not the resolution we think is most absent, however, it's the absence of a 3.5mm microphone jack. This'll be deal-breaker for some vloggers, as the EOS M100's built-in stereo mic will not cut the mustard. Again, we'd head to the EOS 200D, which does have a 3.5mm jack for a mic. The EOS M100 features the same 24.2-megapixel sensor as found in other EOS-M cameras, including the EOS M6, and some of Canon's DSLRs, including the EOS 77D. Therefore, lens dependent (as the 15-45mm kit lens is a bit disappointing in its lack of sharpness), you can expect the same image quality. And just what is that image quality like? Well, all images taken in good light are vibrant. Truly, you'd struggle to find better straight-out-the camera images in good light. The colours in images from Canon's in-house sensors have long been a strength. You'll get natural looking images straight out of the camera by using auto white balance and the standard Picture Style. But as light loses contrast and the camera has to push its processing - achieved by raising what's known as ISO sensitivity - the image quality degrades in order to produce an accurate exposure. This means a gradual loss in crispness and saturation, especially from ISO 1600 and above. For really dark situations, there are super-high ISO sensitivities, but we find images shot at ISO 12,800 and ISO 25,600 are far less useable. We feel there are other competing camera systems that perform a little better in low light. When using the automatic settings, the 384-zone evaluative metering is employed, which uses the entire frame and context of the scene to produce an exposure the camera deems as most accurate. However, as with the camea's autofocus otpions, the metering modes are a little limited. You may find you get over-exposed highlights when there is a wide range of tones in a scene, as the metering system is not versatile enough to select those highlights for exposure. On occasion it can be worthwhile dialling in a little negative exposure compensation, especially when there are bright highlights and deep shadows in the frame. While on highlight detail, we should say the large sensor at the M100's heart allows the camera to capture a wide range of tones (dynamic range) - much wider than a smart phone is capable. However, we have seen better dynamic range in other similar camera systems. Overall, for a camera that's left to its own devices, the EOS M100 makes lovely looking images. This is good news for the EOS M100, which is a camera destined to be put in its Scene Intelligent Auto mode and left to get on with the job. In the M100's favour: it's able to deliver excellent images straight out of the camera; it's small and discreet; its touchscreen-focused controls work well; and wireless connectivity is up there with the best of them. Working against it: the lack of a guided user interface seems bizarre at this level; the oversimplified design hides away more developed manual controls; the autofocus and metering, while fine, aren't class-leading; and if you're keen to mic up when capturing a vlog then the lack of a 3.5mm jack will disappoint. All that sees the EOS M100 sit somewhat in the middle. It's aimed at beginners, but isn't as beginner-friendly as it could be. It might be seen as a second camera alternative for DSLR users, but the Canon EOS 200D seems like too tempting an alternative. Ultimately, our experience of the EOS M100 is mixed. It handles superbly well in parts, but frustrates in others. Handling wise and in visual terms the GX800 and EOS M100 are remarkably similar. The GX800 is much more affordable and is part of a system with more lenses, plus it offers 4K video and better autofocus. As for stills, the EOS M100 has a larger sensor and higher resolution, so expect the Canon to come out marginally on top - but the Canon's deeper dive approach to control isn't to be overlooked. It's Canon's entry-level model and the smallest DSLR around. For the same money as the EOS M100 you get similar image quality, the EF lens range (without needing an adaptor) and additional features - including an external mic port, built-in viewfinder, better autofocus and a longer-lasting battery. 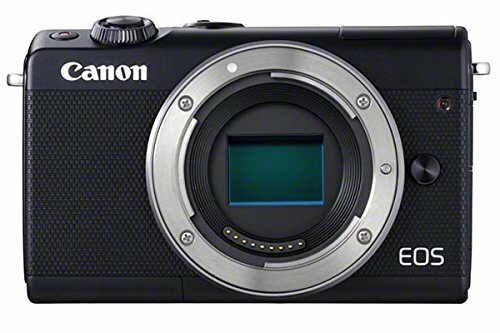 The A6000 is getting on a bit now - but it's still available new and its price has levelled with the EOS M100. You'll get a similarly small camera with 24MP APS-C sensor and generally a superior set of features, including a built-in viewfinder.